A whole bunch of us didn’t know enough to come in out of the rain! 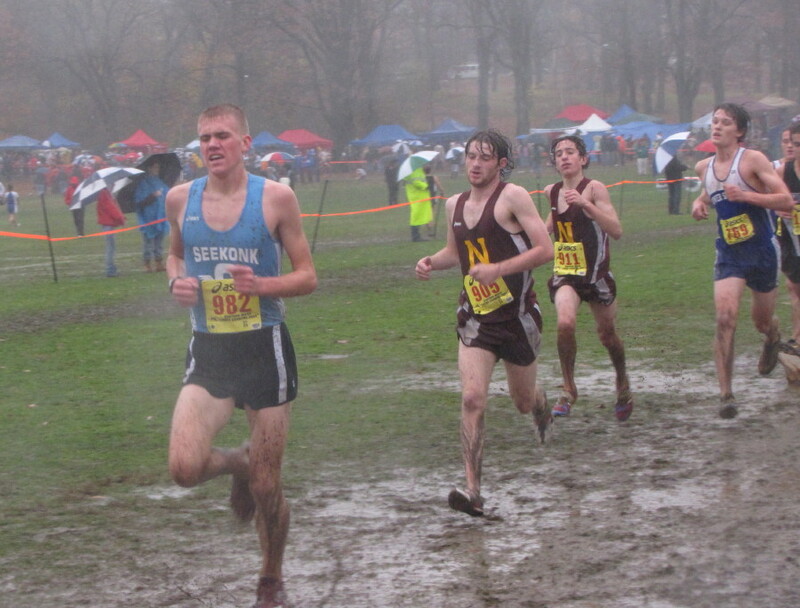 The MIAA opted to ignore the forecasted rainy, windy conditions and go ahead with the Eastern State Division Finals at Franklin Park on Saturday. 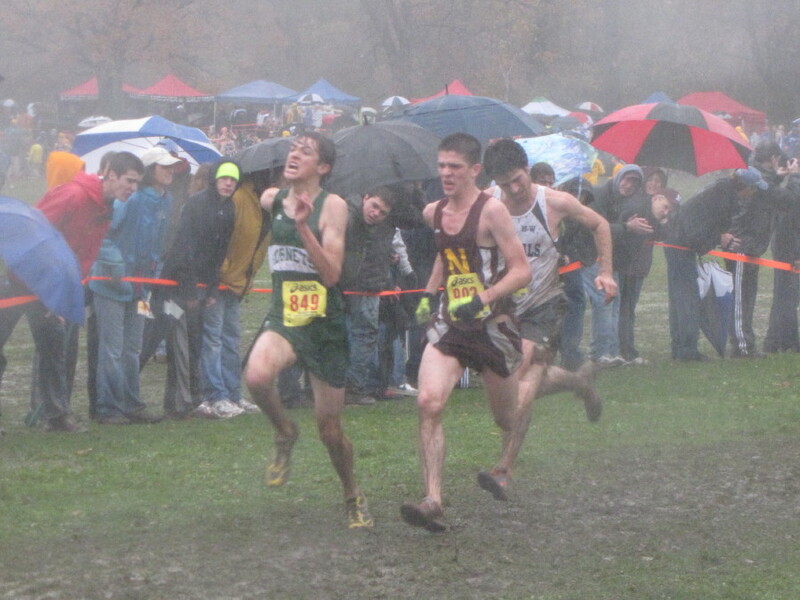 I’m glad they did because cross country is an “all weather” sport in my opinion. This event is well worth attending because you get a good look at the runners most of the time. 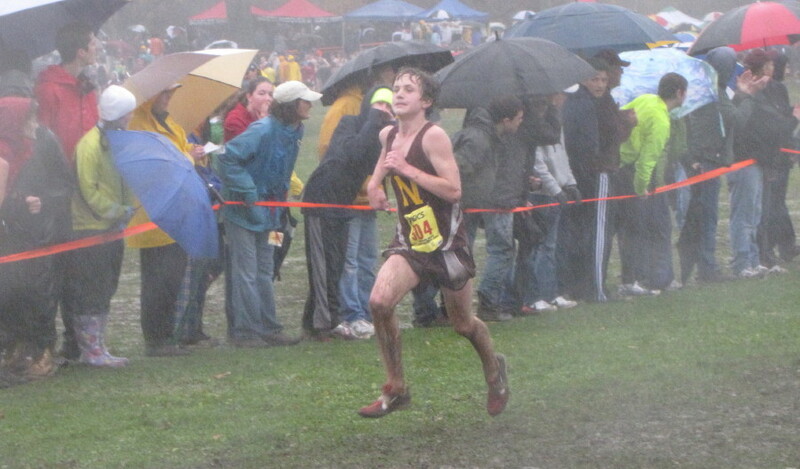 In many races, the runners disappear into the woods and out of sight for much of the race – not at Franklin Park. But you talk about “off” conditions. The mud was in evidence everywhere. 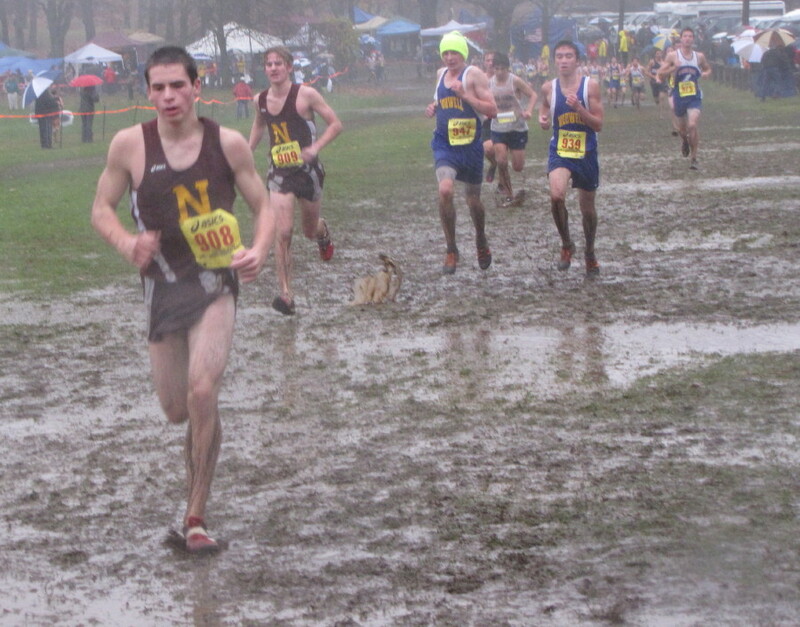 Several places on the course had puddles with unknown depth. Then there was the occasional gust of serious wind. But, surprising to me, I never saw a runner slip. I heard after several races, runners chattering about the fun they’d had on the course. Those puddles came in handy afterwards for cleaning purposes. I doubt that most of the spectators were as thrilled. Keeping dry, even with a good umbrella, was impossible. 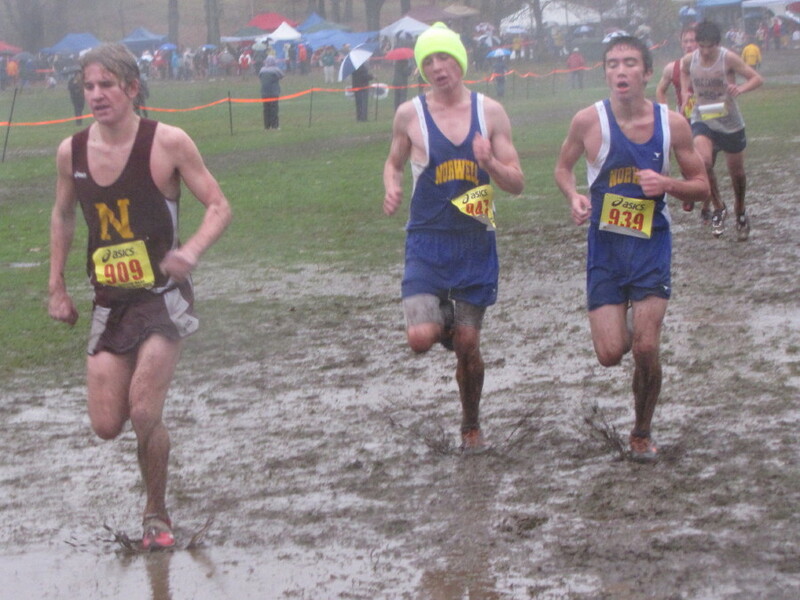 If you got close enough to the runners, you risked getting splattered with mud. 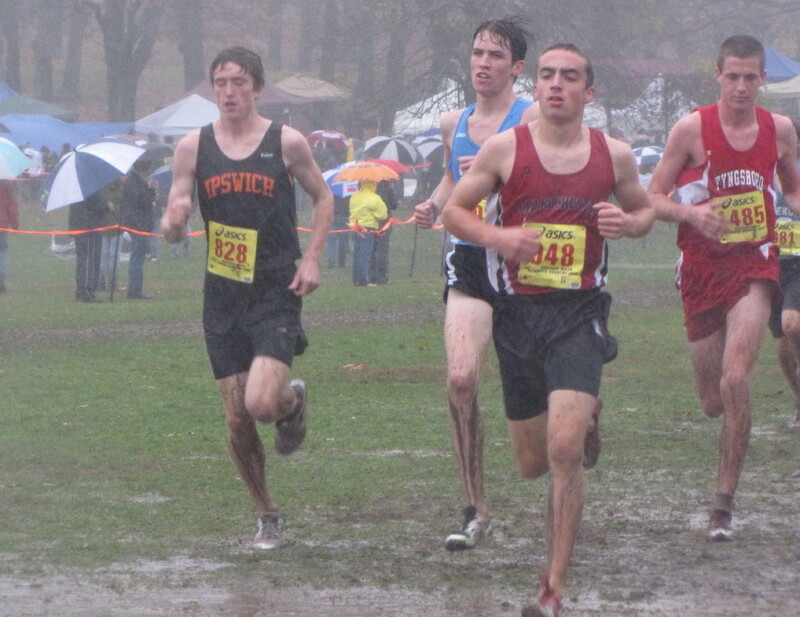 I went to see how Ipswich’s Greg Krathwohl would do against better competion, after I had seen him dominate the CALs. He did quite well getting 3rd. He was very much in the mix for the lead for a good part of the race. 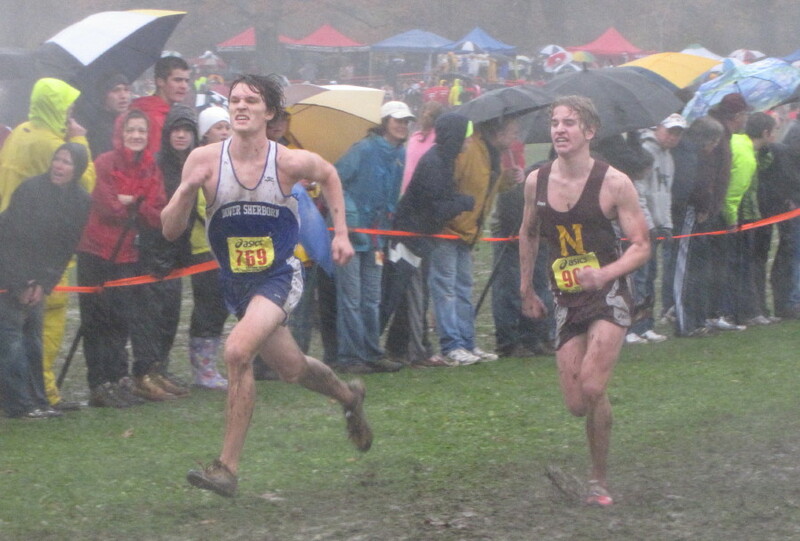 In the end, the two runners who had finished ahead of him at Franklin Park last year did the same once again. 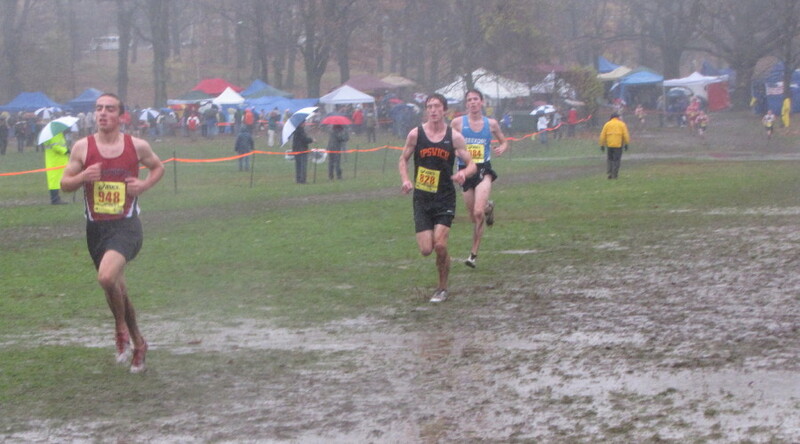 Here is Greg (first time by), (second time by), and (nearing the finish). I also hoped to be on hand for the Newburyport boys winning the East in Division 4. That didn’t happen as they finished second to Seekonk. Greg Englehard led the Clippers and finished #12, I think. 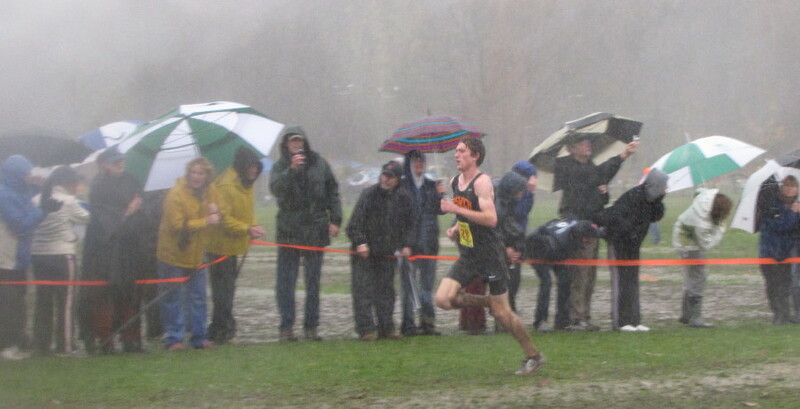 Here he is (2nd time by with Chris Suprin), (near the finish), and (getting medal). Sean Hickman – 28th – (at the finish). 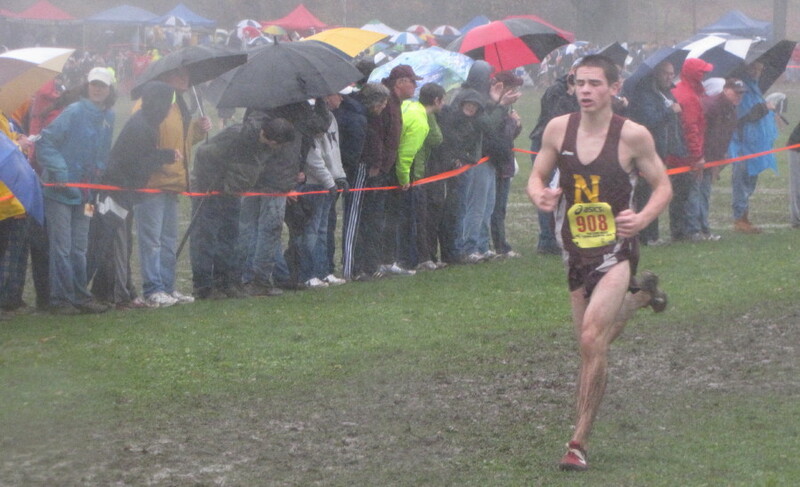 Chris Jayne – 25th – (with Brian Morse 2nd time by), (near the finish). Brian Morse – 27th – (2nd time by), (near finish). 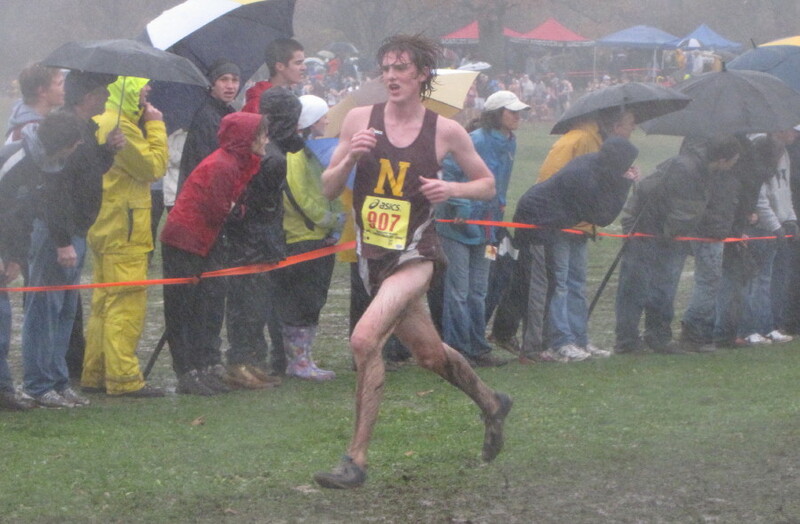 Ryan Clark – 39th – (near finish). Keith Conway – 33rd – (near finish). 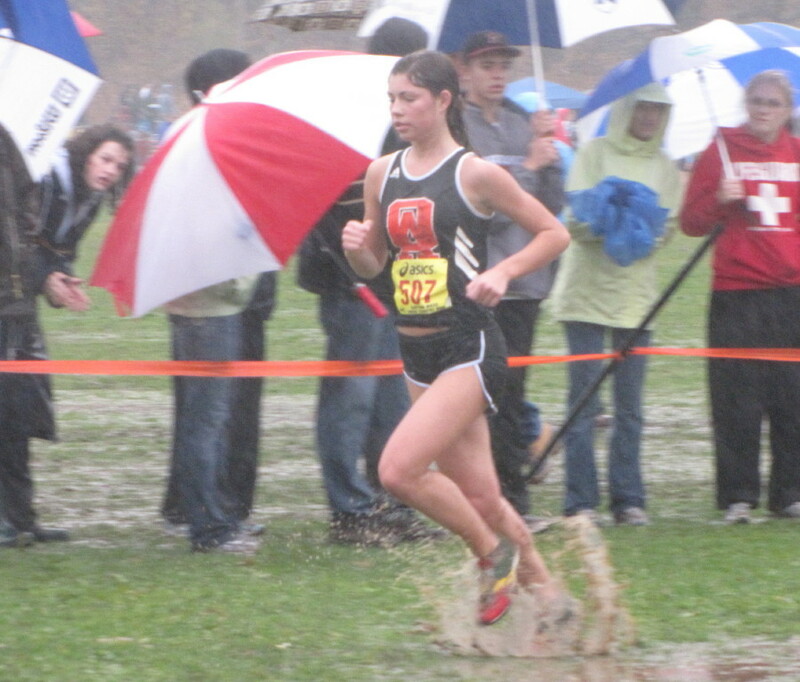 The first race I saw was Division 2 girls and Jenna Davidner of Oliver Ames won easily. 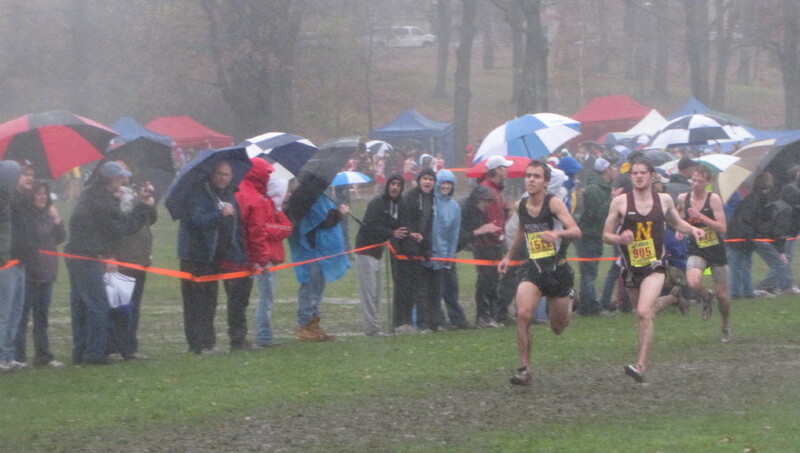 Alanna Poretta of Pentucket took 5th in Division 3 and seemed out of sorts with the weather. She dominated the CAls but in this one she lost touch with the front runners early and never regained it. Alanna will get another chance as will Greg Krathwohl and the Newburyport team on Saturday (November 21st) at Northfield.